Cosmoteer update 0.13.7 is now available! This update is pretty meaty, boasting a couple new multiplayer modes, a bunch of new ship design tools to make building ships easier than ever, and some experimental balance changes to missiles and point defenses. This update adds two new multiplayer features that should hopefully make multiplayer games more fun! First, there is now a "Free For All" mode in which up to 8 players fight to be the last player remaining. This is a more "casual", less competition-focused mode than the Team vs Team mode, which requires more setup and coordination between the teams. Second, both the Free For All and Team vs Team modes now have a "Shrinking Ring of Death" option. Inspired by "Battle Royale" type games, this option causes the Ring of Death (outside of which ships rapidly take damage) to slowly shrink over the course of the match. This option is especially important for Free For All games, because it forces players to engage with other players instead of just holding back and waiting for the other players to weaken each other. The ship designer has also received a bunch of new features in this update, including improvements to Mirror Mode and a variety of new "part brushes". 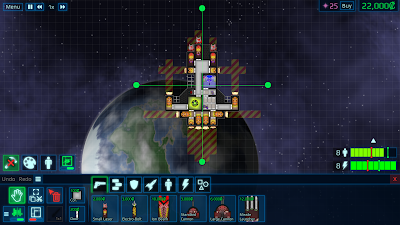 For a long time now, Cosmoteer has had a "Mirror Mode", which when turned on mirrors any changes you make across your ship's vertical "centerline" from its left side to its right side or vice-versa. However, this mode had a couple major limitations, which were that you could not move the location of the centerline (it was always exactly at the center of your ship) and that there was no way to mirror from the top of your ship to the bottom of your ship. Both of these limitations have been rectified in this latest update: You can now turn on a "horizontal centerline" instead of or in addition to the vertical centerline, and you can also click-and-drag "handles" on the ends of the centerlines to customize their locations. Additionally, the ship designer now has a variety of new "part brushes" that can be used when any 1x1-square part is selected. These brushes are inspired by drawing programs like Photoshop and can be used to rapidly "draw" large numbers of parts in various shapes. The available brushes include block brushes up to 10x10 in size, basic shapes (line, box, oval, and triangle), and the frequently-requested "flood fill" (paint bucket) that fills in contiguous areas. All of these new tools are available in both Build (floorplan) and Paint modes. The balance between missiles and point defenses in this update has received a big balance overhaul. 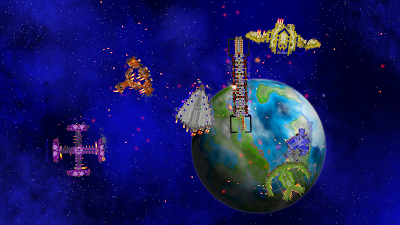 In short, both missiles and point defenses have been nerfed: Missile damage has been cut in half, and point defenses are now much less effective at shooting down missiles. This change comes not without controversy, and I even consider it to be somewhat experimental. However, this change was done to solve a problem that was making Cosmoteer less fun. Specifically, the problem was that missiles were an extremely "binary" weapon, meaning that missiles were either over-powered if the enemy didn't have enough point defenses, or near-useless if the enemy had a decent amount of point defenses. This made ship design less interesting and many battles won-or-lost before the battle even began. 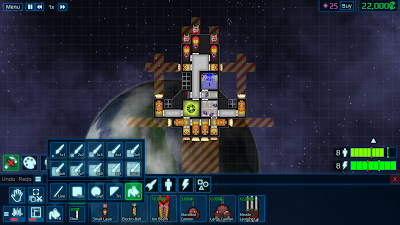 While some rock-paper-scissors balance is definitely a good thing, this was too extreme for a game like Cosmoteer that is all about designing varied and interesting ships. And so the nerf to missiles means that they are less over-powered if the enemy doesn't have point defenses, and the nerf to point defenses mean that missiles aren't useless unless the enemy has an extreme number of point defenses. The major downside I can see with this change is that it likely makes "kiters" (very fast ships armed primarily with missiles that try to stay out of the enemy's shooting range) significantly stronger. Whether they are now too strong remains to be seen. Again, these balance changes are experimental, and this balance is likely to change more in the future. Cosmoteer 0.14.7 - New backgrounds, balance changes, part stats, and more! Cosmoteer 0.14.5 - Nukes, E.M.P.s, Mines, Flak, and more! Cosmoteer 0.14.0 - Little Thrusters, Big Thrusters, and Engine Rooms, oh my!